Apple Macintosh or PC with P4 or equivalent processor. 2.512MB RAM (256MB, 384MB work less well). A modern web browser with Flash Player 7 or higher. Q. Can I subscribe others to Projectory? Q. What is the difference between HTML and Text format for the newsletter? Q. Who are your subscribers? Q. How safe is it entering my personal details online? Q. What if I don't have a credit card? Q. How do I get a receipt for my subscription? Q. I've forgotten my password. How do I get access to Projectory? Q. How do I change my subscription option? Q. How do I subscribe or cancel the e-newsletter? Q. Why have I stopped receiving the Projectory newsletter? Q. The Projectory website no longer remembers me when I try and login? Q. What archives are available with my subscription? Q. Should I be concerned about security on this site? Q. Can I put an article from Projectory on an intranet or on another website? Q. How do I contact the editor? A. Projectory is brought to you by Wade Business Media Pty Ltd (WBM). It is a subscription-based information service aimed at saving industrial equipment and service providers time and money sourcing business opportunities. Its mission is to break news and developments regarding the planning and development of major resource, construction, energy, infrastructure and defence projects in Australia with a budgeted capital expenditure of more than $AUD30 million. Content is updated every weekday. In addition, searchable archives of Projectory articles are available. Full access to all content on Projectory is only available to subscribers. However, visitors to Projectory can freely search The Projectory Capability Directory to source suppliers, manufacturers and operators of industrial equipment and service providers. A. Subscribe to Projectory at Projectory/subscribe. Payment methods include Visa, MasterCard, American Express, Diners Club or please contact Customer Service. A. Yes, up to 16 personnel within your company can have unlimited access. However, clients, contractors and employees of subsidiary companies are prohibited from accessing Projectory under your company's account. Only your Projectory account administrator would have authority to add and remove users and modify an organisation's listing on the Projectory Capability Directory. Authorised users will select a username - or we'll provide them with one - and we'll issue them with a password, which they may then modify at any time. For more information, see our Registration, Authorised Use, Security & Monitoring terms at Projectory/subscription terms or contact our Customer Service team. A. HTML email format displays both graphics and text, allowing for improved readability. Most email systems enable this, however, some such as Hotmail and AOL don't so you may need to select Text format. Some text version emails may not fit the URL on one line. If an error occurs when clicking on the link, please copy and paste the URL into your web address. A. Subscription fees are non-refundable. We may, however, agree to refund any amounts in exceptional circumstances. Email: support@projectory.com.au - Please ensure you include your name, surname, address and email address under which your Projectory account is registered. Q. How much is a subscription? A 12-month subscription to Projectory is $1990 plus GST; subscribe for 24 months for $3570 plus GST, and save $410! a listing on the Projectory Capability Directory to highlight capabilities, company record, accreditation and key contacts. To see the full list of subscribers, visit the Projectory Capability Directory. A. Every effort is made to ensure that your transaction is secure and safe. Passwords and credit card details are transmitted in an encrypted form using industry standard 128-bit SSL encryption to protect your privacy. Information about how Wade Business Media handles your personal details is explained in our Privacy statement. Please allow five to 10 working days for processing once you have posted your cheque payment. A. My Account allows you to update your details, upgrade or change your subscription. A. It is important to enter your email address correctly when you register with Projectory so that we can then email it to you when you have forgotten your password. Please select "Forgotten password?" under the login box. A. Click on the 'Request a new password' link under the login box on the website then follow the prompts. A. Login with your existing username and password, select 'My Profile', click 'Edit' from the menu then enter your password in the 'password' field then confirm your password in the 'confirm password' field. Finally, click the 'save' button at the bottom of the page. A. Go to Projectory to log in. Select "My Account" then select "My Details". Delete your old email address then type in your new email address, then select "Confirm changes". All communication shall be sent to your new email address. A. Please contact Customer Service. A. Go to Newsletter page. Login with your username and password then select "Yes" or "No" to the question: "Do you wish to receive our e-newsletter?". Save your details. A. We sometimes find that subscribers are not receiving our newsletters, or stopped receiving our newsletters, because their spam blockers are being over-dutiful. The most common reason for this is that your email software is marking emails from us as junk mail and sending them to your spam folder, so first check your spam folder. If our newsletters are landing in your spam folder, add news@projectory.com.au to your email address book then emails from us should come through just fine. Alternatively, simply right click on the address at the top of one of one of our emails and add it to your list of contacts. If you have multiple full users subscribed to Projectory's newsletter and these subscribers have stopped receiving our newsletters, then it's almost certainly because of your company's email firewall. It tends to look suspicious when multiple people at one company are getting the same email at the same time and as a result our emails can be inadvertently blocked. 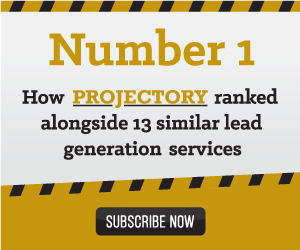 Projectory's emails are distributed by a third party email service provider - Mailchimp. If all of the Projectory newsletter subscribers at your company are not getting our emails - or stopped getting our emails - your Network Administrator will need to 'whitelist' Mailchimp's servers to hopefully prevent future delivery problems. Instructions on whitelisting Mailchimp's servers can be found here. A. Okay. Firstly, you need to ensure the ‘Remember me’ box under the password field is ticked. If that fails try logging on using another browser e.g. Firefox if you’re using Explorer or vice versa. If you’re still unable to login the problem is almost certainly because of a change in your Internet browser settings. Websites remembering you and automatically logging you on are stored in a cookie, so check your cookie settings. Your cookie settings will depend on your Internet browser. For support here, please contact your Network Administrator. A. You are able to search all Projectory archives. If you're concerned about online security in general, please visit one of the following useful websites for more detailed information on how you can protect yourself. Australian High Tech Crime Centre: The Australian Federal Police - Crime policing strategy and how you can report a crime. A. No. All content that appears on Projectory is copyright protected. No Projectory article, index of articles, navigation, logo, branding or advertising may be reproduced on a third party site or publication. When articles, data or photographs are credited to a source other than Projectory it is most likely that the credited source holds rights in the material. Please contact the relevant party directly.